Down in Florida, our rain from Hurricane Hermine is long gone, but if you’re in the path or the wake of it, you’re probably not planning a big cook out for Labor Day… So here’s an indoor dinner idea that could easily feed a crowd. Never actually having Shepherd’s Pie, or Cottage Pie as it’s also called, I had to rely on Allen for his nod of approval. He actually said mine was better than any he’s had at a restaurant! I’ll take that compliment! Boil the potatoes in salted water. Drain, then mash with sour cream, egg yolk and milk, adding a little beef broth if needed. Season to taste with salt and pepper. Saute the veggies over medium heat in olive oil until onions are translucent and carrots are soft. Add the ground turkey to the veggies and cook until done, adding the garlic at the end, then turn off the heat. While the veggies and meat are cooking, in a small pan, combine the butter and flour to make a roux, stirring constantly until light brown. Then add the beef broth a little at a time and the Worcestershire, making a gravy. Add the gravy to the meat mixture. Stir in the frozen peas. Now, put the meat mixture into an ovenproof casserole dish (or leave it in a high sided metal skillet like I did) and top with the mashed potatoes, making sure to cover the entire area to seal in the goodness. Sprinkle with paprika. Bake it in a 450* oven for 15-20 minutes, or in a 425* convection microwave for 20-25 minutes. 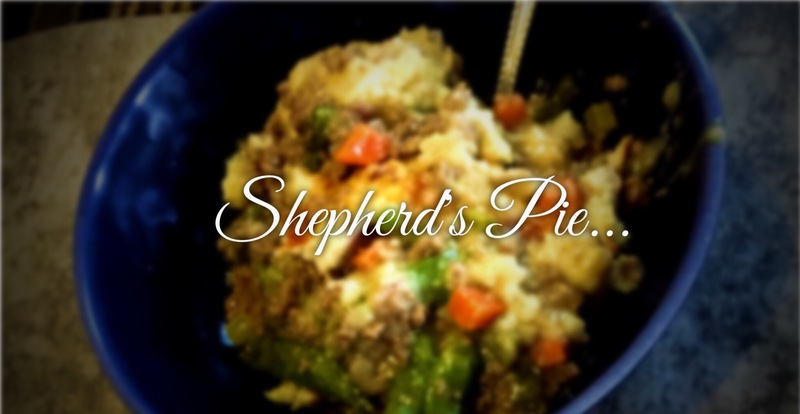 This entry was posted in Food and tagged cook out, cottage pie, food, hermine, hurricane, hurricane hermine, Labor Day, Rachael Ray, recipe, Shepherd's Pie, tropical storm hermine by Rachel Gillen. Bookmark the permalink. How is that cookbook coming along? Thank goodness hubby is climbing towers to burn off that cooking otherwise he would be getting heavy! You got some good recipes… you should start a cookbook! Shepherds pie is def one of my favorite comfort foods. It’s one of my favorites now too!